Dress like Psy, pose like Psy and then send in your best picture. Get all your friends, family, and neighbours to vote for you. If you're in the top 6, you'll be invited to a Gangnam style dance-off to be held at Bulgogi Brothers at e@Curve on 15 March. 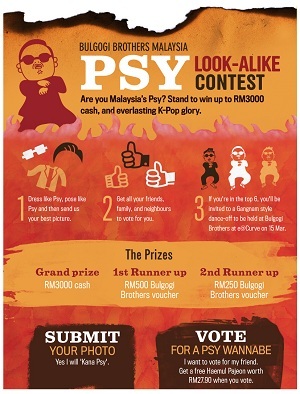 Visit Bulgogi Brothers Malaysia PSY Look-alike Contest for more details.